A simple yet powerful yoga practice, appropriate for all, to awaken the body, quiet the mind, and listen to oneself. A short moving meditation can be a gentle way to welcome a new day or rebalance yourself deskside between meetings on a busy afternoon. Try this sequence when you want to clean your internal slate of distractions and emotions. Like seated meditation, this practice powerfully focuses the mind. Asking it to concentrate at once on both breath and movement, you’ll find that your mind has less room to wander, and quickly clears itself of too much thinking. 1. Stand with feet spread about the same width as your hips, toes pointed straight ahead. Take a moment to stretch in any way that feels good—arms overhead, leaning to each side, folding at the waist, or swinging your arms side to side in a gentle twist. 2. Return to relaxed standing with arms at your sides and eyes closed. You might sway a little—if it’s too hard to find your balance with eyes closed, keep them open. Notice your breath and simply follow it as it moves in and out, for several breaths. How are you feeling? Tired or sleepy? Agitated? Consumed by emotion? Hungry? Note the feelings, without judgment, and return to following the breath. After several breaths, open your eyes and begin to move. 3. On inhale sweep arms skyward, tracing an arc from your hips to the sides and way up until your fingers touch. On exhale sweep arms out and back down as you fold gently at the waist, as if bending to touch your toes. Let your hands come to rest on your knees or shins. On inhale stretch forward until the torso is parallel to the ground. It’s a small movement: reaching the crown of your head forward and letting your spine elongate, your gaze downward. On exhale gently fold your torso toward your legs and hang. Keep your hands on your shins or let them hang down, like a rag doll. Your knees can be slightly bent. On inhale, sweep your arms out and overhead as you come to standing, keeping knees bent and letting your spine gently unfurl, vertebra by vertebra, until you’re upright, hands reaching toward the sky and touching. Exhale as you bring your arms to chest level, keeping the hands together in a “prayer” position. Then relax your arms and let your hands drop to your sides. Take a full breath, in and out. If you like, close your eyes and take another. 4. Once you’ve completed this series of movements (a Half Sun Salutation), start again: Sweeping your arms up on the inhalation, folding over on the exhalation, reaching forward on the inhalation, folding in on the exhalation, rolling up on the inhalation, standing on the exhalation, taking a full breath. Then do it again. After just three of these, you may want to stop and check in. Has some of the tension in the shoulders and neck eased? Have your legs, your torso, your arms gently stretched? Has your thinking mind quieted down as it focuses on the movement? Is your breathing a little deeper, slower, smoother? How are you are feeling now—differently from before you began? 5. If you’re enjoying the experience and its effects, you could try a series of ten. Eyes open or closed, you can flow through the postures incredibly slowly, aware of each micro-movement, or quickly, to get breath and body moving. You can imagine drawing calm in on the inhale and releasing tension on the exhale. 6. Finish your practice standing, eyes closed, gently smiling, keeping your awareness on your breath. If appropriate, offer simple thanks to yourself for the gift of practice. Tailor the practice to your needs each day. Asking “What practice would feel good in this moment?” can be the beginning of taking better care of and cultivating more intimacy with yourself. If emotions or revelations bubble to the surface, take time to explore them. Don’t be too demanding. Don’t force yourself to stretch more or move faster than feels good. If last week, you touched your ankles and today you can only reach your knees, just note the difference. This is a perfect moment to practice compassion for yourself and ask not how can I do better, but how can I give myself what I need to feel my best now? 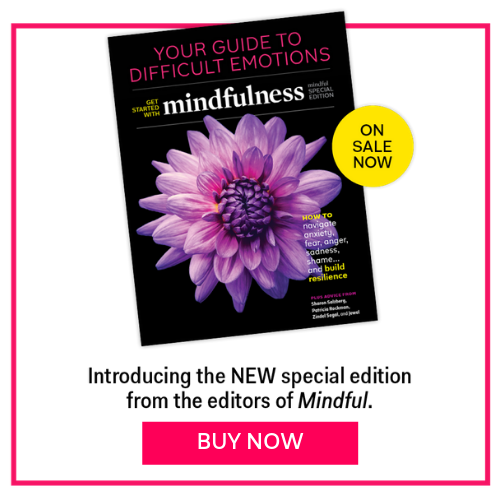 Kaitlin Quistgaard is an editor at large for Mindful. She was previously editor-in-chief of Yoga Journal and senior editor at Salon and at Wired News. She lives with her husband and her daughter in the San Francisco Bay Area, where she continues to write about yoga and meditation and, not surprisingly, works at a startup.